(CNN) Landlocked Bolivia has much to offer travelers, from the wildlife-rich Amazon rainforest to treks in the Andes mountains. One of its lesser known highlights, however, is a remarkable 4×4 journey through the altiplano (high plains) in Bolivia’s desert southwest, close to the border with Chile. Over three days, travelers can take in spectacular and otherworldy desert scenery — terracotta sands strewn with volcanic rocks reminiscent of Salvador Dali paintings, smoking volcanoes, steaming geysers, solidified lava fields and lagoons studded with flamingos. The jewel is the world’s largest salt flat — Salar de Uyuni. It’s bewildering and vast — miles of blinding white salt crust stretch in every direction. Standing atop that crust feels like being on the surface of another planet. A number of tour operators offer guided 4×4 trips, which typically include transport in Land Cruisers, drivers and accommodation in basic refugios and hotels made out of salt. Most visitors start the trip from Bolivia’s unlovely, dusty town of Uyuni and end in San Pedro de Atacama, just over the border in Chile. For smaller crowds and the chance to see the salt flat at dawn, it’s better to start in Chile and end in Bolivia. Whichever way you do it, it’s an adventurous trip through one of the most unique landscapes in the world. 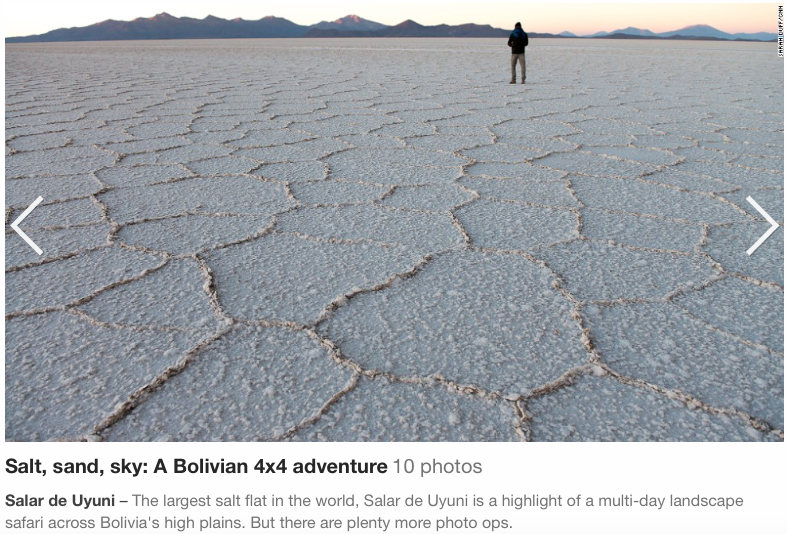 Cordillera Traveller offers three-day and four-day one-way or round-trip 4×4 trips through Bolivia’s southwest desert and salt flat starting either in San Pedro de Atacama in Chile or Uyuni in Bolivia. Cordillera Traveller has offices in Bolivia (Avenida Ferroviaria, Uyuni, Bolivia; +591 2693 3304) and Chile (Tocopilla 429, San Pedro de Atacama, Chile; +56 55 560254). Prices start at $185 per person and include meals and accommodation. Sarah Duff is a South African freelance travel writer and photographer who’s been published in newspapers and magazines around the world. Her work can be found at http://www.sarahduff.com.